Three Rivers put up a much better fight against Moberly Area Saturday than it did in a 26-point road loss on Jan. 26 against the Greyhounds. The Raiders had a minus-31 rebounding differential, allowing the Greyhounds to snag 65 total rebounds and 31 offensive boards. Thirty second-chance points from Moberly Area helped them walk out of the Bess Activity Center with a 103-92 victory for its 11th straight win. Three Rivers was handed its fifth loss in a row and third straight in Region XVI play after a 2-0 start. "It's hard to compete and it's hard to have fun when you can't rebound," Three Rivers coach Gene Bess said. "... I'd like to have just one guy just to hammer the boards, but we really just don't have that, but I think we proved we can play. We proved we can play with Moberly, and we just have to find a way to rebound." Saturday's game featured the second of two matchups between the nation's number 2 and 3 scorers in Alonzo Verge Jr. and Tristan Jarrett. Verge finished his night with 37 points, 10 rebounds, seven assists and four steals in 39 minutes. Jarrett tallied 28 points, 11 rebounds, eight assists and three steals while playing all 40 minutes as two of the top players in the NJCAA battled it out. 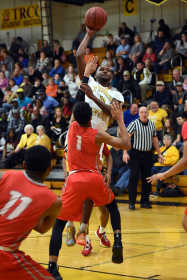 Three Rivers' Tristan Jarrett, top, puts up a shot against Moberly Area's Alonzo Verge Jr. during the first half of a Region XVI game on Saturday, Jan. 26, 2019, at Three Rivers. "The intensity (is fun)," Jarrett said. "Going at each other's heads back-to-back. I like it." After the game, Verge and Jarrett shook hands and took pictures with each other while exchanging some words. "(Verge said) just keep your head up, keep going. He told me to keep going, everything will be straight. I told him keep going and everything will be good," Jarrett said. Three Rivers held a lead throughout most of the first 25 minutes of play, but the Greyhounds stayed within striking distance with dominance on the glass and struck while the iron was hot. "A lot of people don't like rebounding, so it's got to be a muscle memory to go to the rim. We just sat there and watched. You can never rebound like that. You've got to go straight to the rim and rebound just like they're doing," Jarrett said. 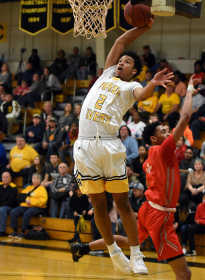 The Raiders led by as many as seven points in the second half after Miganeh Jama buried a 3-pointer at the top of the key for three of his 15 points, but Verge began to take over, doing everything from driving and scoring to kicking out to his teammates in the corners or on the wings for open looks. He sparked an 11-2 run for the Greyhounds with a layup after a pump fake got his defender off his feet. After a drive to the basket from DeMarcus Sharpe, Verge dropped a pass between his legs to Sean Miller-Moore for a flush in transition. Miller-Moore finished with 10 points and a game-high 14 rebounds in 31 minutes. "Their whole team went to the basket. Their whole team. We just sat there and watched, so that's why we went down 31 on rebounds," Jarrett said. "We only had like one person going on our team. Five against one, you know, five is going to win every time." Sharpe gave Moberly Area its first lead of the second half with a 3 in the corner, and the Raiders went on to tie the game once more but never led again. Three Rivers' Mandarius Dickerson (2) tries to dunk the ball as Moberly Area's Tahj Small runs past him during the first half of a Region XVI game Saturday, Jan. 26, 2019, at Three Rivers. With roughly seven minutes to play, Moberly Area took its first double-digit lead on a free throw from Raekwon Drake. The Greyhounds built that lead to as much as 17 points with a minute remaining. The Greyhounds offense was at its peak in sets when Verge was creating off the dribble, drawing help and either finishing at the rim or dishing the ball to shooters. "It's nearly impossible to guard," Bess said. "(Verge) is a very good player. The thing about us is we've got a pretty good player, too, and I thought maybe (Jarrett) would guard Verge. And he did a good job in the first half." Jarrett and the Raiders limited Verge to nine points on 2 of 11 shooting from the floor in the first half before he went off for 28 in the second half. "He's quick. He can shoot it from anywhere. He can pass it, too, so you've got to worry about the pass and the score," Jarrett said. "If he gets back to his right hand, he's dominating, but if he gets back to his left, he can pass it; he can score; he can do anything." In the first half, though, the Raiders looked like a team that came to play. They defended well despite lackluster rebounding, and they led for the first 15 minutes of the game before Miller-Moore gave the Greyhounds their first lead of the night with a putback at the 5:35 mark of the first half. "We were playing well offensively (in the first half), and we were playing well defensively," Bess said. "We kind of broke down in the last 15 minutes, but we were guarding Verge and we were competing really well. But they started getting more shots, and I knew they were physical. They're always tough on the boards." Both teams traded baskets down the stretch before Tallon Fonda sank a trey off of a pass from Aaron Tait. Jarrett made a heady play at the end of the half as he drained a mid-range buzzer-beater after a lot of the players on the court thought a shot-clock buzzer was the end of the half. The Raiders still have a chance to end their time at the Bess Activity Center with a win. Three Rivers will host Nation Wide Academy at 7 p.m. Tuesday in the final Raiders game at the Bess Activity Center before moving to the Libla Family Sports Complex on Feb. 2.